The internet is a wonderful thing. I’ve been so lucky to meet so many wonderful people online, especially since I won the goats. Anna Branner is one of those amazing people. She is an extremely talented spinner, weaver and potter. 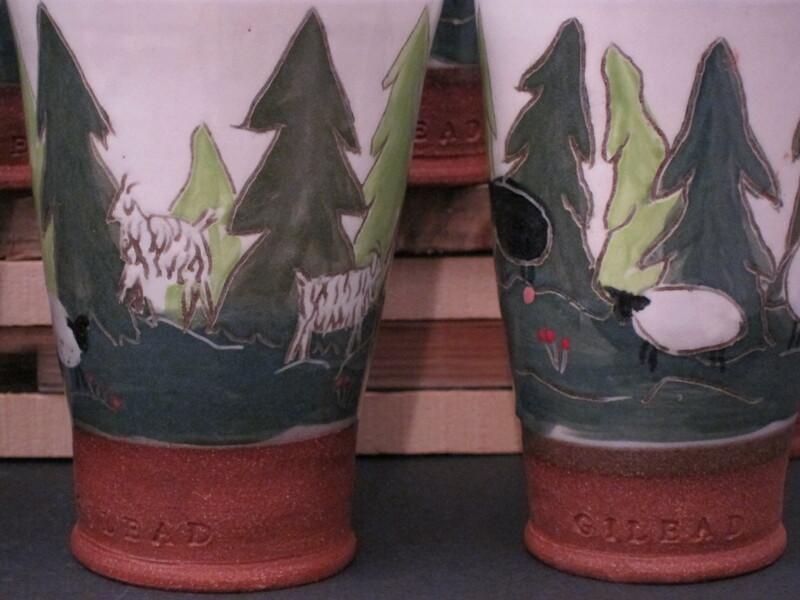 She has created a wonderful hand thrown tumbler just for Gilead Fiber Farm! I had purchased a couple of mugs from Anna, featuring adorable sheep, from her etsy shop. And I just fell in love with her portrayals of farm animals, especially the angora goats. So, I approached her about doing a special design for the farm. My only real input was the shape of the tumbler, I like a big mug, and am not so keen on handles. I had some tumblers at one time, made by another potter friend, whose shape I loved, but they were long broken and lost, so I knew that I wanted something in that basic shape. Anna has outdone herself, the tumblers are gorgeous. They are also nice and thick, so your coffee or tea or whatever stays nice and hot. I love the Gilead stamp at the bottom so much, it makes my heart swell every time I see it. The tumblers are available for sale now! You can get them from Anna’s etsy shop at www.etsy.com/shop/ClothnClay?ref=em . Oops! Welcome Atlas! First lamb ever at GFF! I love these. They are quite beautiful. Bottom’s up!